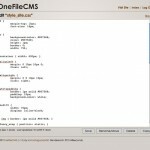 My latest project is called OneFileCMS and, as its name suggests, is a one file content management system. Oh, my! 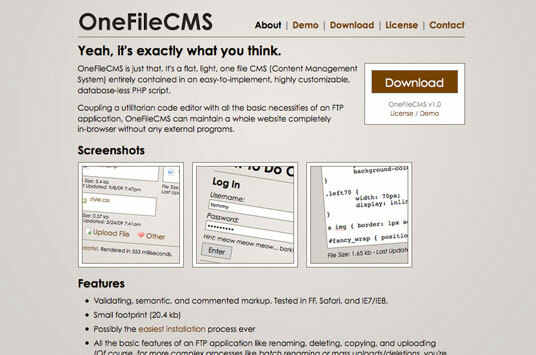 OneFileCMS is just that. It’s a flat, light, one file CMS (Content Management System) entirely contained in an easy-to-implement, highly customizable, database-less PHP script. Let’s say you’ve got an old-fashioned HTML site. Traditionally, you’d make changes by editing your files in a code editor and uploading them with an FTP application. With my OneFileCMS (and other software like it), the two normally external programs are essentially put on the server; changing your site requires nothing beyond your favorite internet browser. 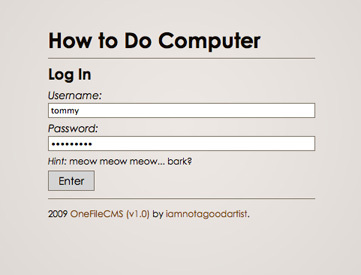 And installing OneFileCMS is as easy as downloading a zipped PHP file, editing it to have a unique username and password, and uploading it the root of your site. From then on, you (or your clients) can administer the entire site by accessing the newly uploaded file in your browser. No database or other files necessary. Left to right: a branded index listing, a branded login page, and the default (unbranded) edit page. The project is currently free for personal use with a $20 suggested donation for commercial use, covered by a Creative Commons “Attribution Non-Commercial ShareAlike” License. I don’t expect to make much from it, but if I could come even close to breaking even with my web hosting, I’ll call it a success. Written in PHP, XHTML, CSS, and jQuery. Icons by famfamfam. Go! Go! Hold on… Go! WYSWIWYG editors have been requested before but probably won’t come standard, as they’d bloat the system out and/or make it more than one file. Plus, if you’re working in PHP or non-HTML code, they’d be more hindrance than anything else. Syntax highlighting is more likely to come in future versions. Multi-language support, while important, isn’t something I can dedicate myself to at the moment. It’s still only Version 1, you know? Yes, the admin link is a bit funky on OpenSourceCMS’ demo. The script is meant and designed to be installed in a site’s root, and their system doesn’t work that way. Thus, the funkiness. I´ve uploaded the php-file (renamed to admin.php) in my root directory and set everything to 777, but if I want to edit a file I always just become the message disabled in the text area field..? Do someone have the same problem or knew a solution? Log in and uploading new files works!! Looks like that bug has affected a handful of users. Stay tuned for the next version of OneFileCMS, which ought to fix it. Make sure you’re running PHP5 and not PHP4, which isn’t supported by OneFileCMS. Apparently, my windows-based host has something funky in their path config – I am gettting the wrong path for files. Can I change the path in a var somewhere? 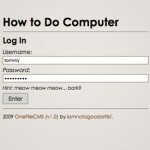 Hello – OneFileCMS is exactly what I’m looking for. I can’t get it to work though. If I try to create a file – it errors out with “cant open file”. If I try to edit a file, it says it completed, but the changes never show. I’ve tried with the file owner as root and 1000, I’ve tried with the file 777, and below – and I’ve even tried with ALL files in doc root as 777. I really would like to get this working – it’s exactly what I need.. Thanks for any help! Not sure, sorry. Ask your host. Hey! I can help you troubleshoot your problems better if you use the contact form on the OneFileCMS site directly. 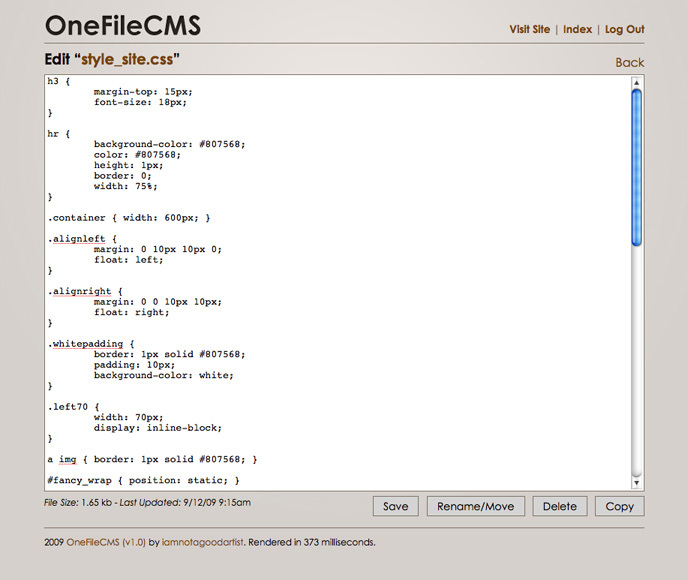 I easily integrated CKEditor with your OneFileCMS for my clients. It’s a little slower but barely noticable. Works great. I hope you continue to develope this dead simple “CMS”. Thanks for your hard work. Why’d you pass the torch on OneFileCMS?